Skyscript.co.uk :: View topic - Any feedback? What do YOU see? Posted: Mon Dec 10, 2018 2:35 am Post subject: Any feedback? What do YOU see? I've been back & forth with the progressions and transits till I can't see straight and my powers of objectivity are fried. I've been referring to Rbt Hand's manual, and progression & transit tables online, since my eyes aren't up to lots of calculating. I've never had formal training, but have attempted to learn for many decades through books, magazines, and one course. One thing I like about Lilly is he didn't have to worry about being a psychologist, which it seems has taken over so much of this. I know he was more worried about being drug off and incinerated! I am eager for any feedback you may be so kind to impart. Hi Jac - I moved your post from horary to the natal forum, since you are asking about transits and difficulty with your natal chart. Horary is based on charts derived from questions posed by a querent to an astrologer and usually a natal chart is not necessary. If you are looking for a horary reading, I can suggest some astrologers, though. I am not sure I understand your question - would you mind clarifying? Are you asking what transits/progressions/profections, etc are showing difficulty for you right now? Posted: Mon Dec 10, 2018 4:56 am Post subject: OOPS! Thank you, very much appreciated. I'm acquainted with horary and no, that's not what I'm looking for, sorry! Yes, I AM asking about the transits & progressions causing trouble. in order of importance for me..
saturn return with saturn now in the first house, as it is in your natal chart.. this is a time of introspection and getting to understand yourself better, as opposed to reaching for worldly goals.. this is a theme for your life too perhaps, but every time saturn gets to the ascendant and first house part of a chart, it is a time for greater self understanding and resetting your focus more for self understanding, as opposed to worldly achievement..
the nodal axis transit is moving right into your mercury/mars square.. the eclipse data this year will be hitting on this part of your chart..
transit of uranus is moving into the configuration involving sun/neptune/uranus..
those are the 3 biggest transits to your chart that i see.. as for interpreting all this, not sure where to begin or what to say.. but all of this would definitely be a challenge in some way, shape and form..
donna cunningham used to just focus on transits.. she didn't feel one needed to work with any other astro tool to get a good understanding of what was going on in a persons chart..
James made a lot of good points regarding transits. I do think people with Saturn dignified often experience Saturn returns/transits a little less troublesome than those of us with badly placed Saturns, but since yours is in the 1st house, it can show issues dealing with health, either emotional or physical, and energy being low. The 1st often deals with the body and soul but is also how we view the world and Saturn can make things seem darker at times (your Saturn is also in a night chart and a melancholy sign, so you are prone towards depression), if we focus on the negative especially. I am a fan of traditional methods, such as primary directions and profections. It is a 12th house year for you and your 12th is ruled by Jupiter, which is in a T square with Mars and Venus in your natal chart. Mars is especially difficult in your chart, as it is in detriment and conjunct Algol. Since this would place emphasis on 12th house matters and move Mars to your 6th, it would show physical or mental health issues coming into focus but this would be until next year. Your next profection after that for two years are Saturn years. Saturn years can be difficult as well but your Saturn is dignified, which makes it a little easier. Saturn entering your first and starting a Saturn profection soon can show a change of focus on your life to things that you might have been ignoring that need dealing with. It isn't always as bad as it seems at the time and often afterwards you appreciate what you have, make new goals and start to see light from the tunnel. I guess the main thing to ask with Saturn transits/profection emphasis is what bad habits do you have that you need to get rid of, such as poor spending, neglecting health, not showing people you care enough, etc. Somtimes you just have to look within and see what needs changing and it isn't external, or it can be both. Often we feel the need to retreat from others with such influences and be left alone, or place blame on others, but that can also make you feel worse. Therapy can be beneficial at this time if you are having trouble on an emotional level. I also think trying to find positive outlets during Saturn years can be important. I had a bad one a while back and I focused on improving my health (through an exercise program that I stuck to religiously) and it helped a lot for me to focus my energies, in spite of a deep depression and difficulty finding work. I had to live with my sisters for a time and I normally hate relying on others but it also helped me to not face life alone in spite of Saturn showing an influence that had me feeling alone and that the world was against me. It was a temporary feeling. Reading Robert Hand's book on transits is probably better than our take on things. That is an excellent book. with saturn back in capricorn it is essentially like a 12th house transit to your sun here... so, this backs up the profection data (12th house theme) that tanit shared with you which i hadn't looked at.. as with any 12th house theme - letting go, which might mean letting go of the past is an important theme as i see it.. what meant something to you previously, might not make sense anymore and as awkward as that might be to accept or adjust to, it might be some of the challenge you face at this moment in your life..
i suspect the next couple of years will be an adjustment period as saturn moves towards your natal sun - late 2020 i think... consider it a transitional period that includes a lot of change in prep for a new beginning... that is sort of how i see the main cycles here working for you..
James and Tanit, your input is greatly appreciated. Tanit, yes the 1st house Saturn casts a lifelong black cloud, but this really magnifies the few rays that come through. I have put myself through a ridiculous amount of introspection, moon in Virgo is obsessive. I have my own methods of therapy. Unfortunately I've undergone some bad strikes to my security, health and work these last couple of years. These were things I had no control over. James, I am struggling with a challenge to my livliehood this last year especially. Independence is paramount, but it's extremely hard right now. Retirement is out of the question. I have no insurance and had to support a loved one half of last year, which forced me to liquidate my few assets. As of now I am struggling to keep my small business going while seeking a better location but unable to find suitable accommodations. My health is not what it was, and even my home is under threat due to terrible management. I didn't intend to drag out a laundry list, but there it is. Can you see why I'm having trouble seeing my way clear? Thanks most graciously for your input and any advice you may impart! Saturn rules your 2nd house of finances, and often during Saturn transits we struggle on many levels. This could continue through the next two years with your Saturn profections, and Saturn is in Capricorm until 2020. Again, I have gone through bad Saturn periods and know how difficult they are. Right now it is hard to see that it will end, but it does. Everything you have described is very Saturnian in nature and most of the time if we heard someone explain these circumstances we would wonder what is going on with Saturn before even looking at your chart. It usually feels like the world is against you but it is said that Saturn is more difficult when we have lessons to learn. You may see repeat lessons if you do not change the circumstances around it, supposedly, but as some say, that sounds patronizing (I do think it is true from my own experiences, though). If you want to understand Saturn better, there are lots of resources on this website. What I find with people who have a difficult Saturn period is that nothing anyone says will make their personal circumstances better, though, and they often do not believe it will end because it feels that way. I find Saturn periods can be a time when we feel imprisoned and powerless (even more so with transit Pluto also in your 1st), either externally or internally. It is especially difficult when a profection and transit come together, which is what is happening for you and what happened during my last one. However, how we deal with the influence is what can make it more bearable. The worst thing to do would be to give up and I also think trying the same things that do not work is a bad idea. The most common influence I see in here from people searching for answers are Saturn issues, so you are not alone and most of us deal with this on some level during periods of our lives, some more difficult than others. The combo of Saturn and Pluto in your 1st is probably going to show extreme constraints changes in your life and cause you to get rid of many things that are not working, and you may not recognize your old life a few years down the road. Personally, they are both transiting my 7th, the opposite house of what you are dealing with (you are dealing with self and I am dealing with "other", or other people) and I immediately began cleaning out toxic people from my life, which has left me with very few people, but the ones that matter are still here. Here is a thread on Saturn returns. Whatever else is going on in your chart generally pales in comparison to a hard Saturn transit/profection. I've read that thread in the past, it's a good one. Lately I've been ruminating my 1st Saturn return. I had dreadful relationships and could sense things coming to a head, even without the warnings. When the smoke finally cleared, I met the special person who's been with me all these years. But this work and home situation is vexing. I am well versed in Saturn. Having been steeped in the discipline, hardship, the taskmaster, structure, crystallization, bones, eyes, teeth. With him in my 1st house I really have had no choice. I'm not whining, Saturn lessons aren't forgotten. I was the toddler who'd see another toddler losing it and acting out and think; WHY is this kid making such a spectacle of themselves? What a sissy! I've been looking for a compatible structure, in fact, but timing has yet to cooperate. Usually when much effort and work are expended, there is some kind of return, but lately, it's just a kick in the teeth. Sounds like a vindictive Saturn alright. So now I'm getting Pluto/Saturn tag-teamed. I'm trying to analyze and explore this intelligently, but feel out of my depth. I'm running out of resources and just don't want to make a stupid decision. "If I don't get off these train tracks at just the right moment.."- that's what it feels like. I take no pleasure whatsoever in having sharp instincts. I just wish they were better focused. Thank you both for your help. I'm grateful for any weighing in on my quandry! 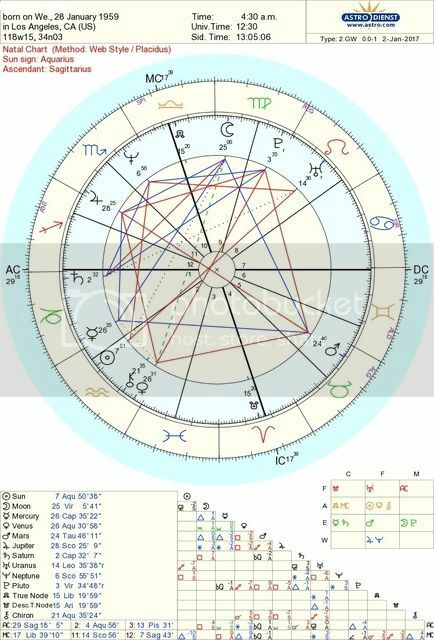 thanks for sharing some of what's going on in your life of a personal nature.. i decided to put the chart up on my astro prog to take a closer look.. first off, i noticed my 2nd comment on the eclipse data lining up with your mercury/mars config is wrong... i thought you had a square between the 2 when i first looked at the chart here, but i see it really is the nodal axis on your mercury... south node on mercury is not a great time for getting great clarity, as your mind and nervous system might need a rest instead.. it is probably best to not come to any hard and fast conclusions at this time as your mind is not really working like it usually does here... thats what i get from transit south node on your mercury.. this will be over soon enough.. the solar eclipse happens jan 20 2019 - fairly close to your birthday... right in that time it peaks jan 20/21st.. after that the energy is set to change... according to judith miller who writes on the nodes, the transit of south node to mercury can also increase your psychic ability, but overall it is a good time to lay off heavy mental analysis and give your intellect a rest! regarding saturn and pluto transit.. the 2 planets are set up favourably in your chart.. i wouldn't sweat them being together here by transit.. it is true pluto is squared onto the midheaven and saturn is due for the same in the next year.. i think you will manage these changes you are already seeking.. don't force anything, if you don't have to.. keep on looking out for an opportunity and one will come along eventually.. as you say in your post above - you " just don't want to make a stupid decision"... that is your fear and it is a valid one.. i just wouldn't push yourself into a decision.. let it come to you when it is ready to come.. easier said then done, i realize! James, thank you for taking the time to put me in your program. You are dead spot on with the assessment of my mental state. I am used to analyzing and do not generally undergo this vague sense of trying to look through mud that I've been experiencing these last several months. Its like trying to pull in a signal, but my antenna's gone! So, great to know that'll be past soon. I will study for hours, day after day, only to feel I've hit a wall- then I must back off for a week or two. I am a workaholic. I am never not engaged in SOME thing. Even if I look like I'm daydreaming, I'm off somewhere. I can ask someone a question in conversation and in the time it takes to get a response I sometimes feel I've circumnavigated the sun and returned. It's weird I suppose. I'll check out Judith Miller, thanks for the tip! No, I don't want to force anything. I've been grasping at straws and was seriously considering an option but the red flags went up in force. That Saturn rising can often be a real killjoy and frustrating, but there are many times you realize it's saved you. Not knowing your age, I'll say I occasionally get annoyed in expectation of the often referenced WISDOM that Saturn is supposed to confer with age, then just realize experience been raising my standards when I wasn't paying attention. I'd bet people are often taken aback by your serious demeanor. I know when I'm deep in thought I seem to frighten people, so that Sag rising doesn't help all that much. Do you find others intimidated with no effort (or even intention) on your part? I know that fire is a great motivator. my demeanor is a mixed bag as i have a few other planets all hanging around the ascendant axis.. i have late scorpio rising with saturn in very early sag - i was born in 56.. i have moon in scorpio about 4 or5 degrees from the ascendant with saturn about 4 on the other side... venus in taurus, very close to your mars and a jupiter/pluto conjunction in late leo which squares the ascendant... my demeanor is a mixed bag due the presence of all of these planets and etc, LOL! saturn in sag is probably a lot different then saturn in cap.. it would be better if my saturn was in cap!!! i think my jupiter in leo always gets the better of my saturn in sag! Yeah Miller cars about 'celebs' a little too much. Will check into Hill when I get better ground under me. I think astrology was less daunting before everyone got involved. Somehow the ancients managed with just seven planets. Now you've got stars (parans) and all these different methods, but now it seems like so many astrologers are disillusioned therapists lookin' to spice up their practices. I wonder about the centuries of cases that made the early astrologers formulate their findings on these planets and aspects. To me, that's the real article. James & Tanit, Thank you gain. I keep going back to this thread and it does help. I so very much appreciate your clarity and objectivity.